Clone Database allows you to create a Complete or Partial Clone of your MYOB RetailManager database. 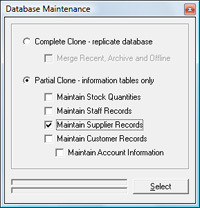 The Complete Clone creates a copy of a MYOB RetailManager database that has corruptions within its structure. As the data is copied record by record the corrupt records will be ignored, the database "relationships" are recreated rather than copied and a cleaner database will result. The Complete Clone also has an option to merge your Recent, Archive and Offline files effectively un-archiving your database. The Partial Clone creates a new MYOB RetailManager database by stripping away all transactions based on your selection criteria. If you open a new store you can partially clone your existing database to keep the stock items and suppliers but remove the sales history, stock on hand, customers etc. as they would not be relevant to the new store. Password Reminder informs you of the shopfront password.